Great concept, solidly executed, minimal, challenging, great boss fight (and satisfying victory), definitely low rez. Nothing bad to say about this one! I really like the idea of the mechanics and way the ship changes to shield. Would love to see some particle effects and some screen shake :D.
Very nice! I loved the shield mechanics. The game is like breakout + a space shooter in one game! Great idea, I like it! Interesting mechanic with shield transformation. Liked it. Great game! Not much to it, but everything here is solid and feels really good. It took me more than a few minutes (maybe 10), but I felt like I had to beat it before I put it down. That's a good thing! Maybe it would be cool to have red & white shields along with the yellow. That could lead to some interesting dynamics! The only negative I have with this game is the sound. The sound effects you have are good, but it seems like there should be a little more (not a lot) going on in the soundscape. @Jupiter_Hadley Thanks so much for doing that. Consider me subscribed! @clemonades Ludem Dare scares the heck out of me. I was unaware of the theme. Drat this wasted opportunity. @louck From a purely ludological standpoint, I want to give the player a reason to get up in the enemies grille. (Reward your players for doing cool things) For nostalgic purposes, that's what Space Invaders does. @OptionSelect I spent a lot of time playing Space Invaders, Pheonix and Section Z when I was working at a construction camp, those are definitely all influences here. Pheonix especially, though this is much less screechy. Shooting backwards actually makes a lot of sense, I should implement that soon. The Boss might need some tuning. I've already spread out the parts that shoot at you, and decreased its health. I've beaten it, but I probably have a longer attention span for this game than anyone else. My goal here was to have a game you could beat in a few minutes, so an easier boss is probably best. 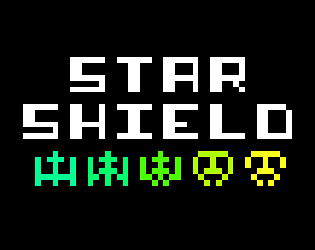 @stuartlangridge The shield protects you against anything yellow. White things can't be hurt by your bullets. This is a solid game. Visuals and sound fit well and is definitely reminiscent of the space invaders days. Unfortunately, the game is tough. I took me a while to figure out how and when to use the shield but after I did, that mechanic made the game much more interesting. The biggest downside I feel is that, as a player, you want to eliminate all the enemies but they are incredibly difficult to kill. One change that I would be welcome (I think) is the ability to shoot backwards, as most of the time I was in the mid to upper portion of the screen just dodging.